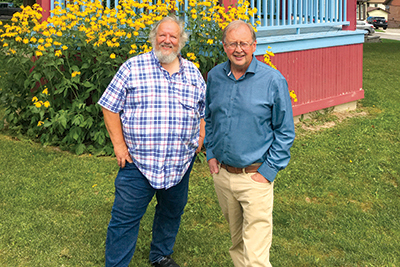 In separate conversations with Dan Needles and Ian Bell, the Citizen learned a good deal about their joint upcoming evenings and matinee of entertainment that will launch Theatre Orangeville’s new season. Named after Mr. Needles’ latest book, True Concessions from the Ninth Concession, the performances are a spin of tales told by Dan Needles along with Ian Bell’s songs and music. He went on talk about the gem for the upcoming show, “Now, for these Theatre Orangeville shows, we’ve been working through Dan’s stories – I’ve got some songs, one that was written for the show and others that we hadn’t used before – they work well. They are funny songs,” he assured us. Mr Needles confirmed, “We’ve been on stage lots of times. He’s a great musician.” He offered a synopsis of the entertainment. “We’re talking about this place we call home in rural Ontario. I’m reading one or two stories from the book but the rest is my telling stories from my life here. Mr. Bell comes to us from a long history in music, primarily based in Ontario, where his name is listed on a lengthy number of credits. This theme is carried through Mr. Needles’ regaling us with reflections of his personal history. His father was an actor, one of the first performing casts at Stratford Festival. His mother “wrote books and was in broadcasting,” including plays for young audiences. His grandfather was also an actor. The family farm near Rosemont which was the Needles home, and Mono Mayor Laura Ryan, Mr. Needles’ sister, still lives there, very often played host to out-of-work actors and their destitution made a strong impression on the young Dan Needles. Dorothy Goulding also founded the Globe Restaurant in Rosemont. Dan Needles cut his teeth on theatre in Theatre Orangeville, premiering his Wingfield plays here and commenting, “I can remember when the theatre space just held files. The town realized its potential and hired Jim Betts to put it together.” Thus, creating Theatre Orangeville. On the other hand, Ian Bell is coming to us for the first time to Theatre Orangeville.